Major depressive disorder treatment is for people living with an overwhelming, prolonged sense of sadness and low mood. As described below, its symptoms typically include a loss of interest in pleasurable activities, low self-esteem, and isolation. This illness goes by many names, such as Clinical Depression, Major Depression, Unipolar Depression, and Recurrent Depression. It’s important to note that the low mood one feels is persistent and doesn’t seem to change even if the circumstances in one’s life might change. 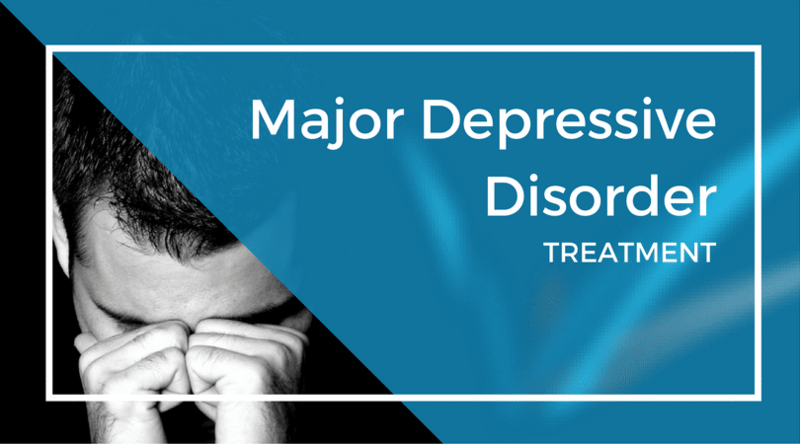 Fortunately for those living with major depressive disorder, there’s help available. A person with Major Depressive Disorder can occasionally experience periods of relief. However, there will be periods of intense sadness that seem to negate any of one’s positive feelings or experiences. This constant weight of sadness can cause a person to feel apathetic, hopeless, and shame. Those with this illness might distance themselves from others and some may experience suicidal thinking. If this disorder goes untreated, it’s common for someone to succeed in ending their life. Major Depressive Disorder is not like feeling the blues one day, and it is not a mood that a person can simply snap out of. Clinicians recognize that Major Depressive Disorder is a brain disorder which needs to be appropriately treated. Take a look at some of the common symptoms below. There’s some serious misunderstanding around depression and what it looks like. Living with major depressive disorder doesn’t mean you let yourself go and ignore your responsibilities. In many cases, people living with depression are able to function effectively despite their perpetual depressed state and go about their day with the misunderstanding that what they feel is just their life. According to a recently study, researchers concluded that 50% of depressed Americans don’t receive treatment. With over 350,000,000 people living with depression globally, that’s a lot of people who live with the misunderstanding that it just doesn’t get any better. If you’re experiencing one or more of these symptoms, it’s important you take action sooner or later. Research has shown that the best Major Depressive Disorder Treatment includes both psychotherapy and medication. Anti-depressants can affect the chemicals in the brain so that someone with the disorder experiences less heaviness and sadness. Psychotherapy can work to address any unresolved issues in one’s life that may be contributing to the depression. For many individuals dealing with Major Depressive Disorder, Intensive Outpatient Treatment (IOP) may be another strong route to go to get help. IOP treatment programs provide a part-time schedule that is designed to work around other work and family life commitments. This intensive program provides the benefits of support, structure, and accountability while still accommodating family, work, and other obligations. This form of therapy can be extremely helpful in that it provides a person with some relief immediately. Therefore, there can be improvement in a relatively short amount of time. The therapist or psychologist can help a person identify thought patterns that might be triggering sadness. Also, the therapist can facilitate insightful awareness of those thought patterns so that new and healthier thoughts can be used. Also, a therapist can help a person gain clarity about their feelings, insights regarding what is improving or worsening those feelings, and relief from the overwhelming sense of heaviness. Frequently, someone with Major Depressive Disorder forms false beliefs, and psychotherapy can help reestablish an objective point of view about oneself. Intensive Outpatient Treatment generally includes psychotherapy, but can provide mindfulness therapy, coaching and group therapy as well. As mentioned above, medication can help adjust chemicals the brain may be producing, which can affect one’s mood. Anti-depressants affect certain neurotransmitters in the brain, easily lifting one’s mood. This can provide an immediate sense of relief. Because Major Depressive Disorder is such a common mental illness around the world, there are many different options for medication. Speak to your psychiatrist about the options available to you. For some, part of healing from Major Depressive Disorder might be to spend time in a residential treatment facility. Because of the many resources available to a resident of a treatment center, there can often be a significant amount of healing that takes place. With high levels of support, trained staff, therapeutic groups, individual therapy, well-prepared meals, and more, a person immediately feels well cared for. This alone can contribute to healing from the disorder. If you or someone you know is experiencing the symptoms described above, contact a mental health provider for assistance. Looking for answers? Use the form below to get in touch with us.